Gourmet cooking is rooted in simple techniques, so knowing the temperature for perfectly grilled chicken can be the key to serving an amazing entrée. Perfect for the warm weather (or any weather, for those determined enough), a barbecued chicken dinner done right will be a big hit. Chicken is resilient and a wide range of grilling temperatures can be used. However, for the best results, chicken should be cooked in a two zone grill setup: one side of the grill should be on medium-high heat and another at just medium. On a gas grill, aim for a temperature of 350 to 450 degrees (depending on the cut). On a charcoal grill, only pour the preheated briquettes on the half of the grill. Chicken should always be cooked to 165 degrees Fahrenheit (73 degrees Celsius) in order to be safe. This includes chicken breasts, thighs, drumsticks, and wings as well as whole or quartered chickens. Breasts: Cook chicken breasts at 375 to 450 degrees for just a few minutes on each side using the hot side of the grill, browning the surface. Move it over to the lower heat section if it still needs to be brought up to a safe internal temperature. Breast meat has very little fat in it and can dry out quickly, so don't dawdle. Bone-in leg pieces: Sear these over the hot side of the grill, rotating every 1 to 2 minutes. Move them to the warm side of the grill and cover, keeping the temperature at 350 degrees until a safe internal temperature is reached. Wings: Grill wings over medium-high heat (direct heat on a charcoal grill) with the lid closed, turning the wings every few minutes. Keep the grill around 350 degrees and cook the wings until they reach a safe internal temperature. Whole chicken: Place the chicken over low-medium heat on a gas grill and over indirect heat on a charcoal grill, keeping the grill temperature between 350 and 400 degrees. Cooking a whole chicken will take at least an hour, possibly one and a half hours, until it reaches the right internal temperature for safety. As with all meats, it is important to cook chicken to a temperature high enough to kill any unsafe bacteria. 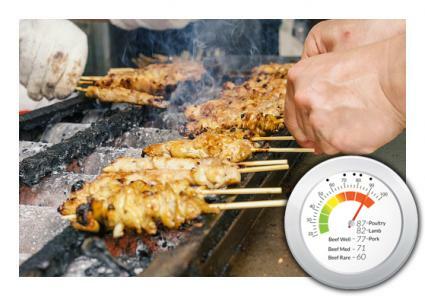 Regardless of the grilling or barbecuing technique used, the best way to ensure food safety in poultry is to use a meat thermometer. Once the inside of the chicken reaches 165 degrees, as indicated on the digital meat thermometer, it is done and it should be removed from the grill. If the chicken is boneless, make sure to place the temperature probe at the center of the thickest part of the cut of chicken. If the chicken is on the bone, probe at the thickest part, stopping at the bone without letting the thermometer probe touch the bone itself while taking a reading. While a digital thermometer is the best and the most fool-proof way to determine the poultry's internal temperature, if no thermometer is available, ensure the juices from a cut piece of the chicken run clear, not red or pink. If you're adding barbecue sauce to the chicken, wait until the last 2 to 3 minutes of cooking; barbecue sauces are generally high in sugar and are at risk of burning or sticking to the grill grates. To avoid a mess, save it for the end. Once the chicken is up to temperature, allow it to rest for a few minutes before cutting it. This will allow the juices inside the chicken to redistribute so that the final product is moist and juicy. During this period, the chicken will continue to cook, so consider removing it from the grill a few minutes before it reaches 165, set it on a plate, and cover it in foil to help retain its heat. However, when doing this, be sure to leave the thermometer in place to ensure it gets to that temperature before serving. Avoid cooking it to a much higher temperature as the chicken will become dry and tough. Chicken is a versatile and delicious protein source that's naturally lean and flavorful. It lends itself well to all kinds of preparation and is especially delicious when grilled. When it comes to cooking well, it's important to start with the basics and learn the right way to grill poultry properly; from there, the gourmet sky is the limit!